During my trip to Jakarta, I always have time to lookout of the window and pampered my eyes with the scenery. Paddy fields, bridges, people houses, and piles of junk. I don’t think the latter is a good sight. 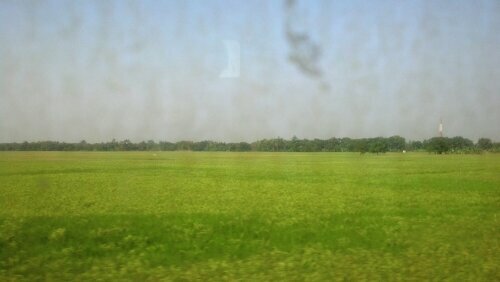 But anyway, after stopped for a little while in one of small station before Cirebon, I have a really good view of green paddy field, and what I want to do is to capture it by my camera phone. But as you see in the picture, the window is dirty. Folks, in this life-time sometimes we make judgement, we spend time in putting value over something, whether it’s good or bad. But do you realize that our judgement could be very biased when our “window to lookout” is dirty. I am not saying that we cannot judge nor put value on things. Yet we have to be really careful and make sure we have cleaned our way of seeing, inside-out. ← I see it coming on.